Do you lead or do you manage? Is there a difference? Sure there is. To be successful as a leader, you need to do both well. 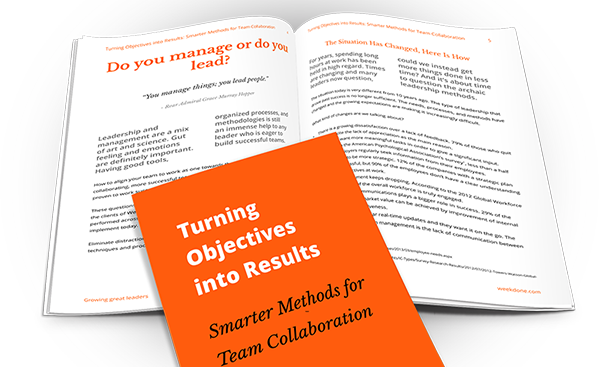 To help you out, we wrote a new e-book on smarter methods for team collaboration. Download it below. Too many people get together without really knowing why, simply because it was on their weekly schedules. It's soon time to set annual goals for 2015. How to do it right? A time management and planning process from the great US President. The techno-philosopher on "features and bugs" of companies. An approach to allow your people to make 10 decisions a day. Besides weekly online reviews, here's how to meet your people monthly. Some things are known to fail. Here are some you should not try. Josh Bersin, one of the world's top HR tech analysts on the industry. Brian Tracy on keys to employee happiness and productivity. Research and statistics on what differentiates millionaires from others.